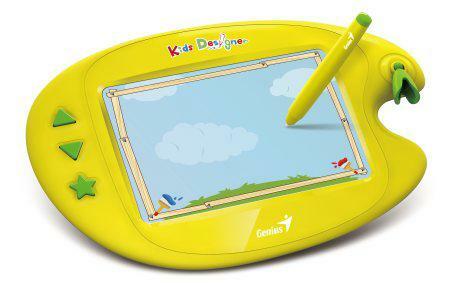 There is a new kid on the tablet block; a tablet meant for use by children everywhere! Named Kids Designer II, the tablet from Genius breaks new ground in the tablet segment with its unique design that makes the entire device resemble the color palette of an artist. The main display area is made up of a 5 x 8 inch screen. The tablet is aimed at the 3 to 8 age group. Pre-loaded in the tablet will be games and a other apps that the company claims will boost the child’s creativity and learning abilities. There is also a stylus included in the package that which will come in handy for little minds to dive into their drawing and writing skills. Large volume keys dominate the front of the tablet that otherwise is quite uncluttered. The tablet is currently available in the US and Canada for $64.99.